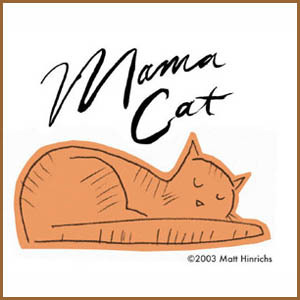 Mama Cat is a little book written by Christopher and illustrated by Matt. Matt's website, Scrubbles.net, was one of the first to post a nice blurb about Oddio Overplay. It made me so happy, and inspired this list of links to sites with cat songs to celebrate his book. Please check out Mama Cat [some reviews]. This one is also dedicated to the folks who made the music and to compassionate folks everywhere. In the USA, a homeless animal is euthanized every 9 seconds. You can help. The Humane Society of the United States is a great place to start. Pets911.com can help you to find an adoptable pet or to volunteer at a shelter. A portion of all sales go to the non-profit Annex Cat Rescue in Toronto. Rudee and the boys recorded this sometime between 1928 and 1930. This fun three-piece would like for you to hear their EP and CD, too. Yay, four theremins and one guitar!! What's to become of the tiger? Does YOUR cat eat Rice Krispies? "And the cat stood in the flowers, two ears above"
Now get up from the computer and play with a cat!